According to Wikipedia, today is the anniversary of the discovery of Delaware Bay in 1609 by Henry Hudson. As Johnny Carson used to say, "I did not know that." Indeed, I never knew that Hudson came this far down the East Coast. 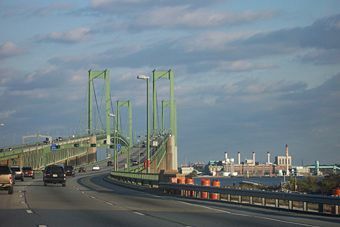 Yes, it's the freakin' Delaware Memorial Bridge. Long time readers will know of my fear of flying. Well, that fear also applies to tall bridges, and this one is no exception. I've probably been over it 50 or 60 times in my puff, but even at this last crossing - on our way back from Maine - the Missus remarked on how white my knuckles looked as we came down on the Delaware side. 2.) We stay in the center-left lane no matter what. 3.) Everybody in the car just shut the hell up. 4.) Make sure we have plenty paper napkins on board so I can wipe the sweat off my palms and the steering wheel once we're across. I'm sure Mr. Hudson would be proud. UPDATE: In response to some of your comments: I know all about the Chesapeake Bay Bridge, but unlike several of you, I've never actually been over it. I've also managed to avoid the old "Cuppah" River Bridge in Charleston of infamous repute despite the fact that my brother went to med school there.